Inspired by the eight arms of the octopus, the device has been specifically designed for surgical operations to enable surgeons to easily access remote, confined regions of the body and, once there, manipulate soft organs without damaging them. It is believed the device could reduce the number of instruments, and thus entry incisions, necessary in surgical operations, with part of the arm being used to manipulate organs whilst another part of the arm operates. The device, which has been presented today, Thursday 14 May, in IOP Publishing's journal Bioinspiration and Biomimetics, holds a key advantage over traditional surgical tools due to its ability to quickly transform from a bending, flexible instrument into a stiff and rigid instrument. It has been inspired by the eight highly flexible arms of the octopus which have no rigid skeletal support and can thus easily adapt to the surrounding environment by twisting, changing their length or bending in any direction at any point along the arm. The octopus can, however, vary the stiffness of its arms, temporarily transforming the flexible limbs into stiffened segments to allow the octopus to move and interact with objects. To achieve the same effect in the robotic arm, the researchers, from the Sant'Anna School of Advanced Studies in Italy, constructed a device that was made from two interconnecting identical modules. Each module could be made to move by the inflation of three cylindrical chambers that were equally spaced inside the module. By alternating and combining the inflation of the three chambers, the module could be made to bend and stretch in various directions. The stiffness of the two modules could also be controlled by exploiting a 'granular jamming phenomenon' in which a flexible membrane inside the module is filled with a granular media. When a vacuum is applied to the membrane, its density increases and the whole membrane becomes rigid. Lead author of the study Dr Tommaso Ranzani said: 'The human body represents a highly challenging and non-structured environment, where the capabilities of the octopus can provide several advantages with respect to traditional surgical tools. In their study, the researchers performed a number of characterization tests on the robotic device, showing that it could bend to angles of up to 255° and stretch to up to 62% of its initial length. The stiffening mechanism was able to provide stiffness increases from 60% up to 200%. 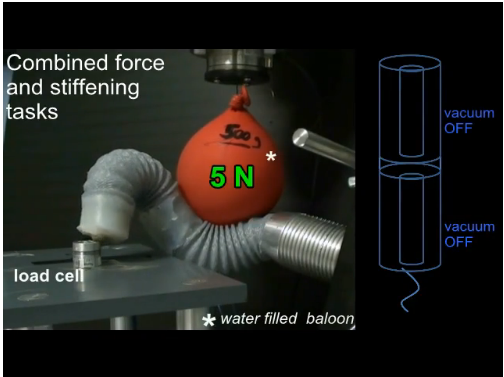 The ability of the robotic arm to manipulate organs while surgical tasks are performed was successfully demonstrated in simulated scenarios where organs were represented by water-filled balloons. 'Traditional surgical tasks often require the use of multiple specialized instruments such as graspers, retractors, vision systems and dissectors, to carry out a single procedure,' Dr Ranzani continued.